This article was written in 2007. Dates and names have changed, but the general plan has not. months, three times/week for three miles for a total of nine miles/week. If you only run once in a while or can only run a mile or two before tiring, then you need to work on basic aerobic fitness for a few months so that you can run 3 times a week for three miles. If this is the case then your goal should be to complete a half-marathon next spring (or late in the fall, depending on your progress). 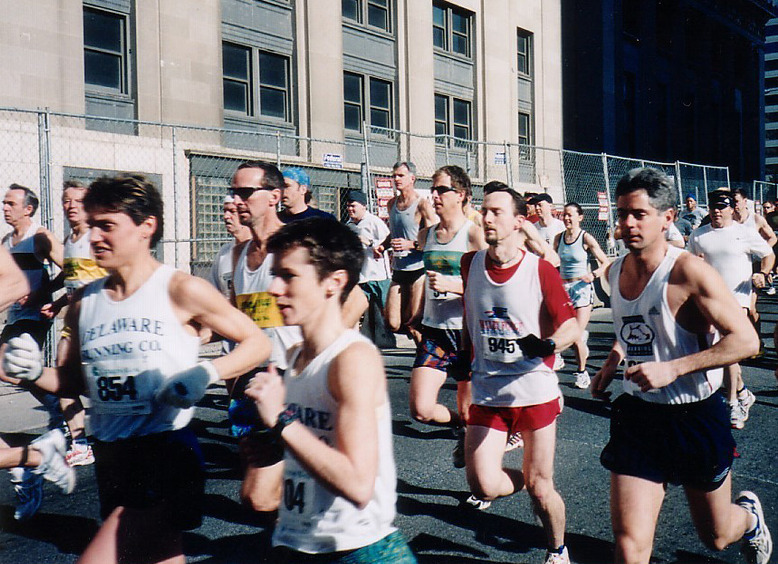 If you have been running for a while, this schedule will allow you to safely train to complete the Philadelphia Rock’n’Roll Half Marathon (formerly Philadelphia Distance Run) with no set time goal. You should not set a time goal unless you have been consistently running 20 or more miles/week. Talk to us individually if you want to set a time goal. In our schedule, each week runs from Monday to Sunday. You will gradually be introduced to three elements of running: long distance, pace or tempo running, and racing. Long runs, which are scheduled on Sunday, are the most important aspect of your training. You must build up your long run in order to complete the half marathon. Pace and tempo running will be gradually worked in after you have built up some more mileage. also. Be sure to warm up with an easy mile and cool down with an easy mile. 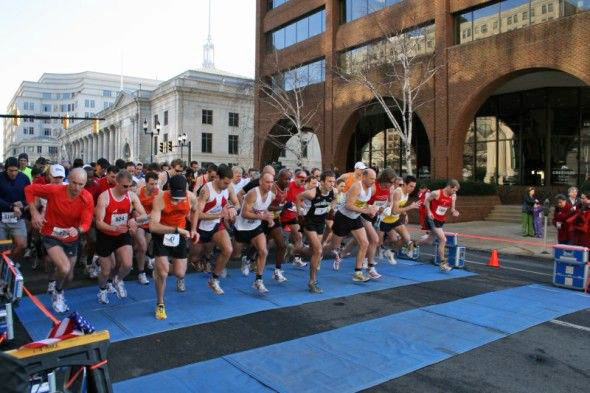 Racing is the final aspect we want you to experience before you enter the half-marathon. 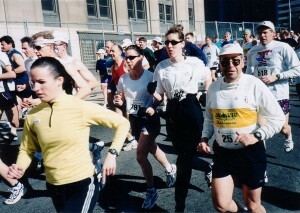 Going to the starting line with thousands of other runners without a clue of what to do can invite disaster. We want to schedule group outings to three races. Since the summer sends people everywhere, if you can’t go to the ones we pick, try to go on your own wherever you are. 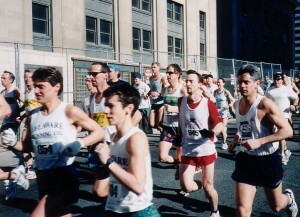 Marathon Sports website, www.races2run.com, is a good place to look for races. The first race we are suggesting is the Catherine Rooney’s Irish Pub 5K (July). This race will introduce you to the racing experience. No pushing yourself here; just enjoy the experience. The second race will be another 5K in Aug. Here you may want to push yourself a little. Lastly, we will go to the M.O.T. Big Ball Run (5 Miler) in Middletown in late Aug. Finally, a word about some items you should have. If you don’t have them already, get yourself a good pair of running shoes, built for the way you run. If you don’t know what you need, go to a shoe store where they can help you figure it out. In the Delaware Valley area, the three best are probably, Delaware Running Co. in the Greenville Shopping Center, Women’s Sports Specialties at the Shoppe’s of Limestone, or the New Balance stored on Concord Pike or in Newark, DE. Water, water, water… You should be bringing it to every run, drinking 6 to 8 oz. every 15 to 20 minutes, and drinking water throughout the day. If you are not constantly running past your water source, a water bottle belt is a good idea. Lastly, consider getting a sports watch, so that you can time yourself at distances. A watch is not an absolute necessity to finish your goal of a half-marathon, but knowing your paces and how fast you are doing your mileage will help provide feedback that you can check with against what your body is telling you. Monday and Fridays are rest days. Tuesdays and Thursdays are easy days (3 to 3.5 miles). Saturdays start as easy days and become Pace Days after the first month. 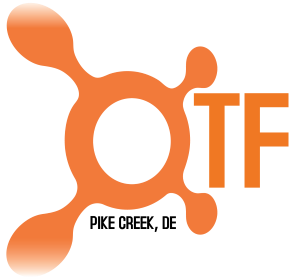 Wednesdays are tempo (speed) days with the following schedule: 6/19- 2x4min, 6/26- 5x400m, 7/2- 2x6min, 7/9- 6x400m, 7/16- rest, 7/23- 2x8min, 7/30- follow Runner’s World Schedule. Sundays are for long runs on the following schedule: 5/24 (Sat.) and 5/25 – do 4 to 5.25 miles between these two days, 6/2- 3miles, 6/9- 4 miles, 6/16- 5 mi., 6/23- 4 mi., 6/30- 4 mi., 7/6- 5 mi., 7/13- 6 mi., 7/20- 5 mi., 7/27- 7 mi., 8/3 – following Runners World schedule. Then starting Monday, 7/28 you will be on the Runner’s World Schedule.